This homemade costume for men entered our 2011 Halloween Costume Contest, and won 3rd place in the Favorite Halloween Costume nomination! 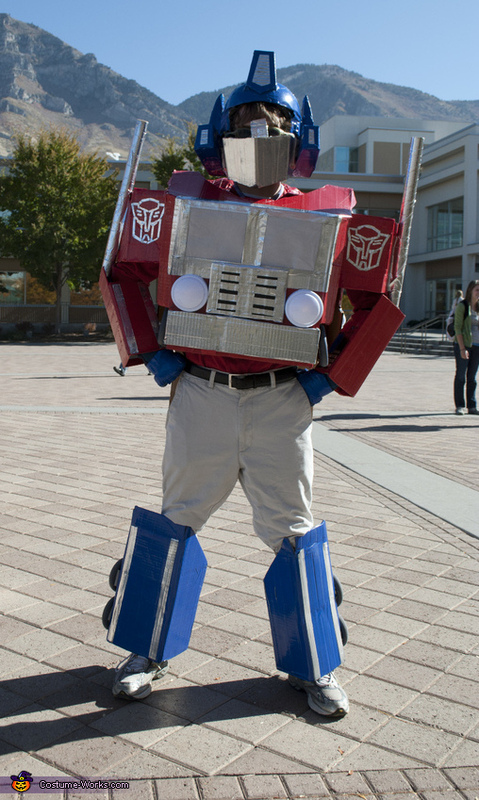 This is me in my transforming Optimus Prime costume. It was my attempt to make one that both transforms and actually looks like him (most are one or the other). The design was developed through trial and error as the costume was constructed. Any attempt to explain how this thing is built would be very long and complicated. This costume took, among other things, two wardrobe boxes and eight or so rolls of colored and gorilla duct tape. That's Awesome David, you're a genius! You've definitely got my vote. Lovin this. The transformation is amazing. Wish I was cool enough to pull it off. best costume ever! Because its two costumes in one because you can actually transform with this costume! He needs to win. He's just so shiny! Also, he probably needs some money to make up for all the duct tape he used. This costume is so awesome!!! The amount of time and thought put into it is amazing!!! This was great--In addition to winning this contest, there's got to be some kind of duct tape contest to win too!! This is an awesome costume!I wish I could make something like this. Way to go! I hope you win!You need to win because I have never seen anything like this. This costume it the most amazing thing I have ever seen. It must have taken him weeks to put it together. I wish I could have seen it in person. Assolutamente impressionante la tua costume di Optimus Prime, sei propio bravissimo, complimenti David. This is probably the best transforming optimus prime I can find on youtube!!! Apparently, my comment is too short so I must say more things that are superfluous. This thing is awesome David. I am impressed with your craftsmanship--way to pull it off. It looks like you rocked Brigham Square with that thing. Well isn't that creative. What an engineering feat. Would like to have seen it in person. Taylor would love it. I cannot believe this is a real thing. The youtube videos with you scooting around is the icing on the cake! I love how awesome this is. I can't even describe it any better than just plain awesome; I'm at loss for words. Wow this is the coolest transforming costume I've ever seen! Must've taken forever, way to go! Hope you win kid! Wow! I have never seen a costume that can transform into another. Very well thought-out. It looks awesome in the pictures. I bet it is even better in person! It gets my vote. Amazing David!! Not only do you look like a transformer when you are a truck, but also when you are untransformed. What ingenuity it must have taken to create an Optimus that looked like Optimus in all stages! Cool transformable costume. And duct tape is cool. This comment is not long enough. I don't know what else to say. Totally terrific transformer Great job! Hope you win! It must have taken you a lot of time to figure this one out. Awesome Optimus Prime costume! I like it a lot! I can't believe you made that yourself. Hope you win! Thanks to everyone for the comments! This costume was definitely worth the experience, but I think I might tone it down a bit next year. Impressive costume, great interlocking pieces, takes the cake. Beware the Decepticons, they are sure to go after your costume, thinking its the real Optimus Prime. This such an awesome costume. I hope you win! I have never seen a costume likethis. I bet it took a lot of work. Your hard work sure paid off. Perkins! That is seriously one of the coolest things that I have ever seen!! You have to win! The video of you transforming makes it even better! I love it. Is your Optimus Prime costum all made out of cardboard boxes? It think it is awesome. this costume is amazing, Dave you are an amazing costume maker.I am sure you will win! !I will not be able to do stuff like that, you are a geniooo!! Cool costume! My brother totally saw you transforming, by the way. Hope you win! Why is this comment too dadgum short? I'm proud to call you a part of my dinner group :) this costume was seriously amazing, you make transformers fans everywhere proud. that's a rockin transformer dave. you must have put alot of time into making it, good luck and i hope you win. Can I marry you? Because this seems like love at first sight. I wanna marry someone just like optimus prime. This is by far the most legit costume I've ever seen! This costume definitely does the Transformers justice! Way to be! Yeahhhhhhh! Nice Optimus Prime work! :) Yeah, yeah, yeah, yeah. Lookin great. Uh-huh. Nice, nice work. Love how it actually transforms, wish I could have seen it. We too are entered in this contest, but were absolutely amazed at your transformation. Incredible job. Sure it took a long time. Would love to see the video of you crawling that a voter referred to. My 10 year old son and 12 year old daughter were awwwed by your costume. Good luck in the contest. Thanks for the attention! Best of luck to you. Nicely done :D My roommates have shown your costume to everyone they know. That must have taken forever! Dear David. You are super duper awesome, and this is the coolest costume I have ever seen in my entire life. I can't believe you made it by yourself! way to go! Dave, that costume is awesome! Or should I say "costumes?" Both forms are really, really good! Nice job! Nicely done Dave! Impressive that the costume is functional in that you can transform into a semi! How many hours did you put into designing and building this costume? The attention to detail is great. This is impressive. It's not very often that you see a Transformers costume that actually transforms, even though that's kind of the point of being a Transformer. The costume is ingenious. It is common to see painted faces and such, but such an enginered piece of lovelyness deserves somthing. I wish there were an easy set of instructions, but there isn't. I just got a huge pile of big cardboard boxes (wardrobe boxes and moving boxes) and experimented. I drew it up on paper and figured out the rough concept and then started messing around until it seemed to work. A word of warning, though: this costume was REALLY heavy. It was fairly taxing on my back and shoulders to wear it for more than about ten or fifteen minutes at a time.